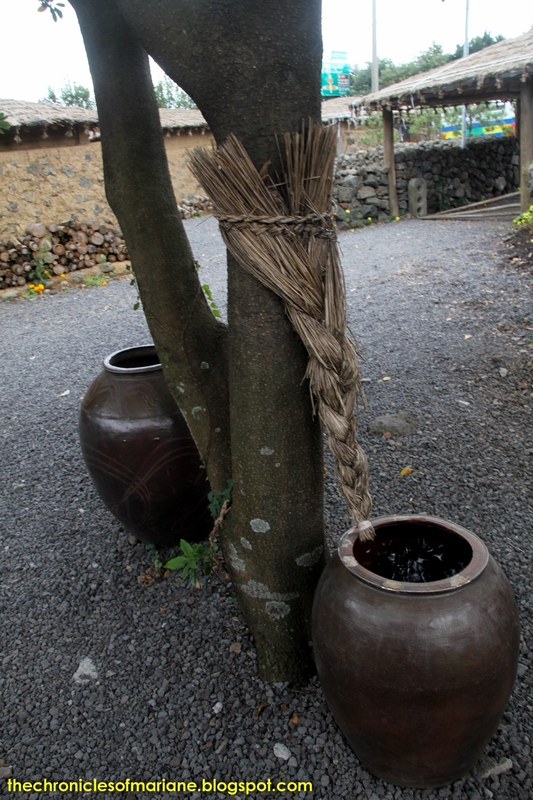 Our next stop after Trick Art Museum was a traditional Korean folk village called Seongeup. There was folk village museum that is more touristy but I decided to go here because we haven't been to an authentic folk village yet. The one that we went to in Yongin was established last 1970s that was made for tourism so native Koreans did not really live there. 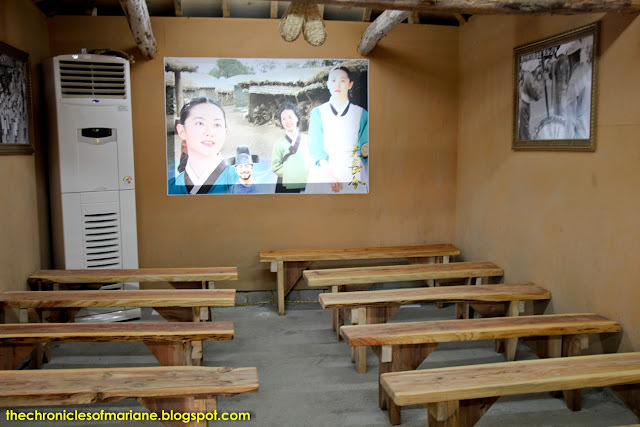 We were not able to go to Andong in Gyeongju as well as I have told in this post. So technically, this is our first experience on the real deal. Seongeup Folk Village (성읍민속마을), located at the foot of Mr. Halla in Jeju, is a small town that displays unique culture of the island such as the abundance of black lava rocks scatered on the ground and are even used in their houses, the abundant display of stone grandfather statues called harubangs, the distinctive conventional "restrooms" and the local black-haired pigs. The trees that stand in the center of the vllage are also said to be more than hundreds of years old. Once we have reached the village, our driver introduced us to a local of the village who was very glad to tour us aroud the place. 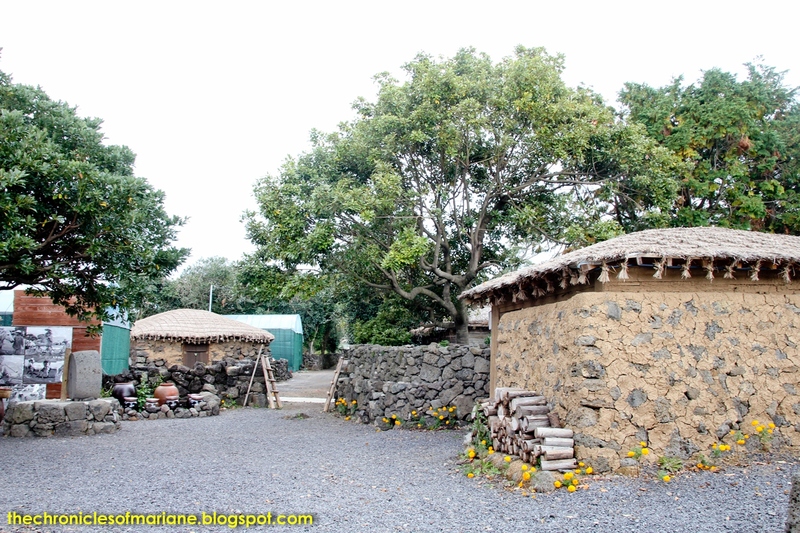 The place has about a thousand thatched roof house that were made volcanic lava stones and clay that helped demonstrate how the people of Jeju used to live back then. Our guide let us inside of of the houses and explained some of the furnitures the people used back then. I was also able to notice some fences that seemed like they were gates for the houses. We found out that there was a meaning behind it. If one bar is up it means 'the owner of the house is gone for a couple of minutes and will be back soon', two bars means that 'they will be out the whole entire day' whereas three bars stand for 'gone for quite a long time'. Neat huh? Our guide has then directed us to some jars attached to a tree. As water was very scarce in this village (being filled up with volcanic lava stones everywhere), the townspeople had to fnd ways on how they can preserve or gather water for daily usage. One resourceful technique they have thought hundred of years ago was to set up jars near trees, in the branch was a straw that cleans the rainwater coming down from the leaves to the containers. I looked inside and the water looked clean enough for washing dishes, taking a bath, etc. There were also jars that were fixed to look like a back pack. 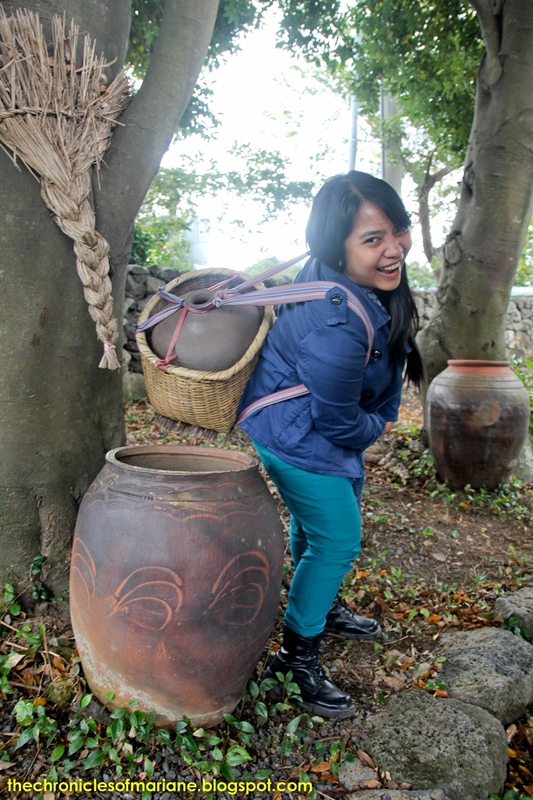 We were told that ancient women of Jeju used this to bring water from one place to another. Usually, the source of water was quite far from the village so they had to carry it on their backs. I thought the jar was pretty heavy! Good thing we have jugs now. Long time ago, men were treated like kings. According to our guide, due to the volcanic eruptions back then, lots of males have died and the ones that have survived were involved with war activities. So there were only few of men left in the villages available to procreate, thus the special treatment. The head of the families were not allowed to do heavy work as it may damage their health. Therefore, all house chores and other work were left with the mother, who also had to take care of the children at the same time! Sheeesh! 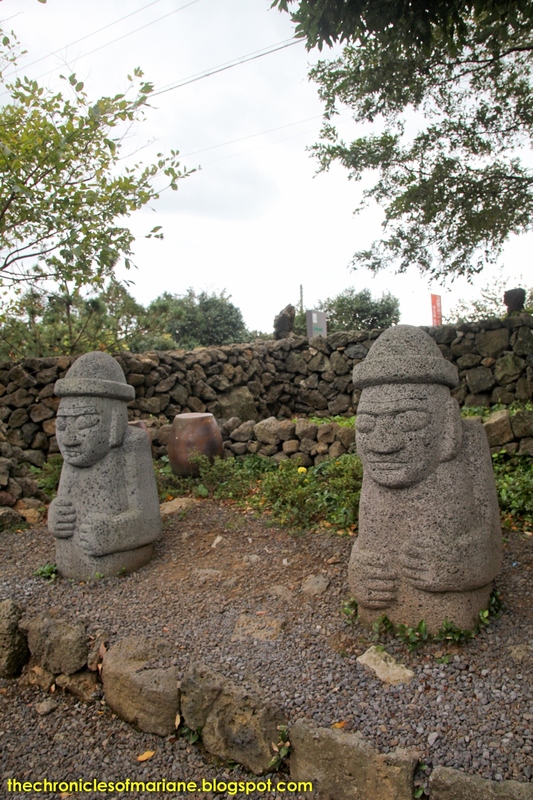 As we were roaming around the village, we were introduced to these harubangs (stone grandfather statues). We were able to see some at Yongduam rock however there were tons of them in the village, and in different kinds too. Our guide made us play a bet on who can guess on the type of harubangs as shown in the picture above. 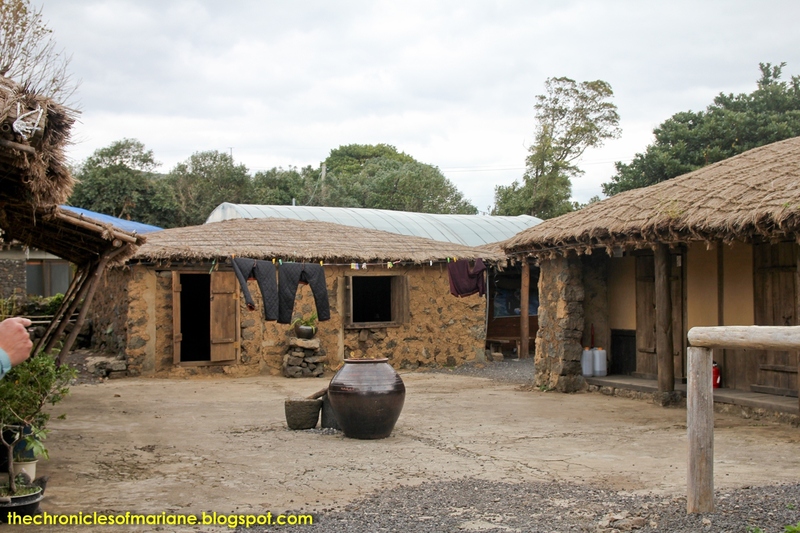 At the end of the tour, we were told that the village was a shooting place for a Korean drama called Dae Jang Geum. We were then directed to a class room (that was air-conditioned! ), and were introduced to some products being produced by the residents here. They were pretty expensive and of course, I did not want to be ripped off, so we politely declined to buy anything. The guide was alright with it and we thanked him for showing us around. I felt bad that the tour was for free, but maybe our driver has paid him anyway. Heukthojeong - great heuk daeji indeed! We stopped for a quick lunch and because the island's specialty is black pork pig (heuk dwaeji), we did not pass the opportunity to try it, of course! We have been deprived the other day from meat, so we were so excited to finally have some of this, which was said to be very nutritious and that's a big plus. 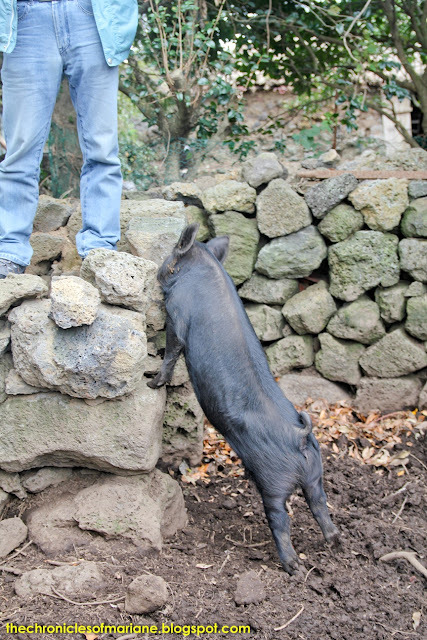 The meat is not black, but was called by its name due to the black hair of the pig. The meat that we had was cooked ala samgyupsal. 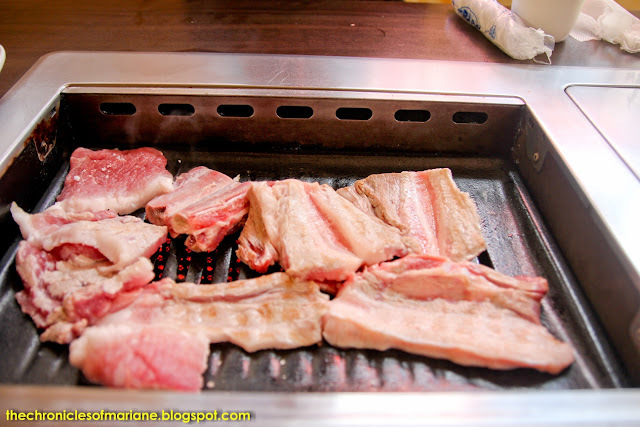 The meat was very succulent compared to the usual meat you could get at the restaurant and was very tender compared to the meat I have previously eaten here in Korea and in the Philippines. 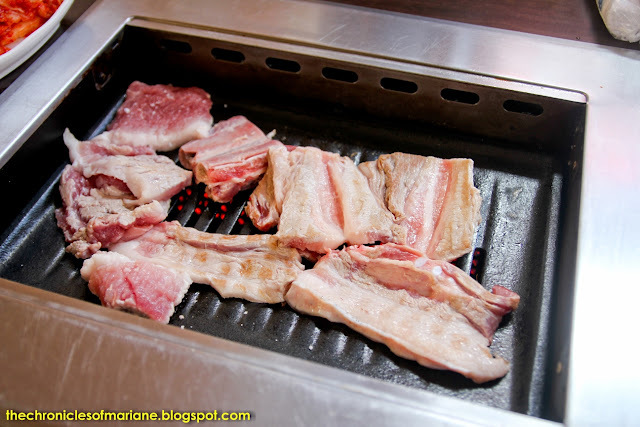 I thought that the meat was really juicy and a bit saltier(?) compared to regular meat, which I loved! 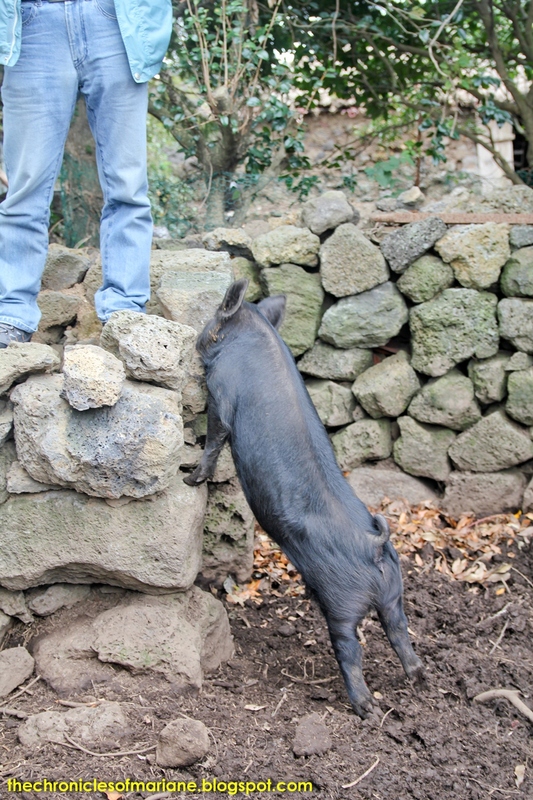 Of course being a special type of meat, the black pig was more expensive. The meat that we had was 24,000 won but it was enough for me and my friend already. Yup, happy tummy it was. I really recommend this restaurant because the owners of the place were so nice. 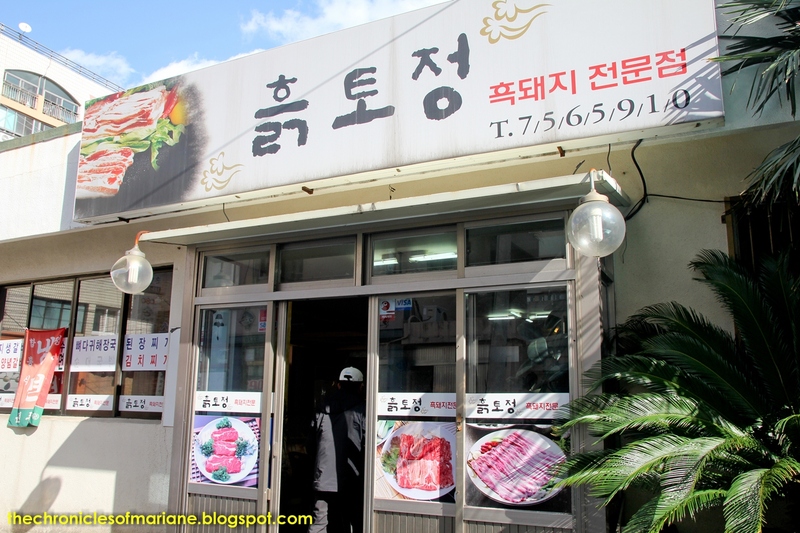 The ahjumma here gave me a quick know-how on the black pig's meat and the banchans were really good! 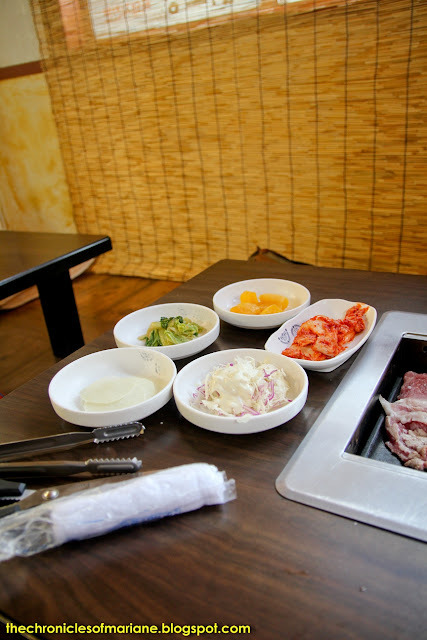 I had lots of servings of their kimchi and the cabbage salad. Our driver did not join us for lunch though as he wanted to take a nap because he did not get much sleep last night due to our early schedule for the day. I can say that even though we did not get to see lots of things at the village, it was still a wonderful activity because finally I have felt the authentic traditional-village atmosphere, knew more of how ordinary Koreans lived through the old times and all of these is because of the help of our local guide. I doubt that you would be able to appreciate the place without anyone touring you around. 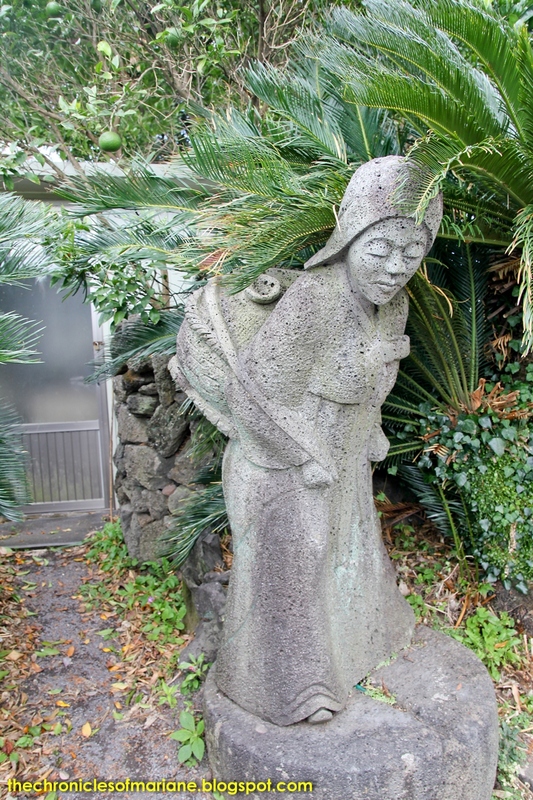 This is a must-visit if you are particularly interested in the local Jeju culture.